Eligible students will have their tuition fees covered by the Free TAFE initiative. FedUni TAFE provide a broad range of quality education and training programs, reflecting state and national priorities that address the training needs of individuals and industry. Visit the Victorian Skills Gateway (external website) to help find a course that suits your interests and career aspirations. 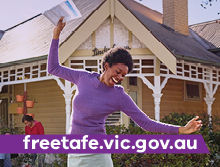 From 1 January 2019, the Victorian Government Free TAFE for Priority Courses initiative will cover tuition fees for 30 priority non-apprenticeship courses and 20 Victorian apprenticeship pathway courses for students who are eligible for government-subsidised training. Read further information about priority courses and find out if you're eligible. The high quality of our TAFE programs has been confirmed at the Victorian Training Awards. FedUni TAFE won awards in three categories; Victorian Apprentice of the Year, People’s Choice Award Winner and Employer Award for Apprentice Development. Winners were selected across 13 categories for individuals, employers, training providers and industry collaboration. 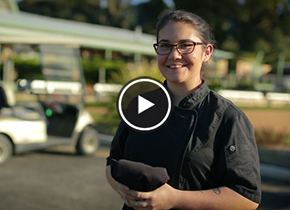 Alyssa Heard's passion for cooking resulted in her being offered an apprenticeship, and enrolled in a Certificate III in Commercial Cookery where she has won several awards, including being named the Victorian Apprentice of the Year and People's Choice Award. As well as being passionate about cooking, Alyssa loves baking and is now back here studying a Certificate III in Patisserie. Alyssa will now go on to represent Victoria at the Australian Training Awards. Nazareth Care won the Employer Award for Apprentice Development in partnership with FedUni TAFE. Nazareth Care Ballarat's mission was to support disadvantaged members of the community as part of expanding their workforce, and to provide these individuals with an income and a future career pathway into health and aged care. Trainees working for Nazareth Care have undertaken the Certificate III in Individual Support at Nazareth House in Ballarat.